Mondays to Thursdays Ian and I try really, really, really hard to not eat too many carbs, and my personal obsession is trying to cut out bread. So that on the weekends we can eat whatever we feel like without analysing our choices, and it's actually working out great! 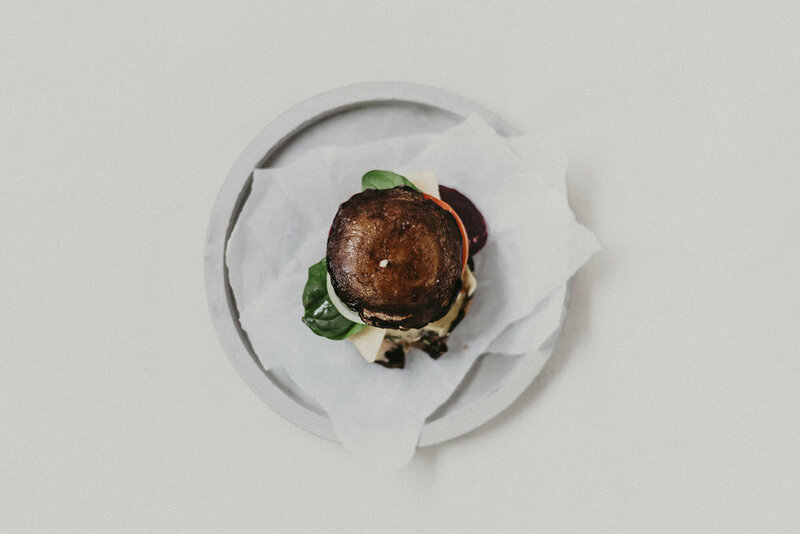 This week I was intrigued to try a bunless burger and although the mushrooms were quite expensive, I must say it was delicious! Plus I made my own ailoi sauce!! Took a while but felt good knowing I'm cutting out necessary preservatives and sugars. Cut the chicken breast into a good size for your burger. Place it in between 2 pieces of baking paper and flatten it (I used my skillet). Season with garlic salt, smoked paprika, pepper and olive oil on both sides. Set to the side. Trim the stems off the mushrooms and line a baking tray with baking paper. Add the mushrooms stem side up and season with garlic salt, pepper and olive oil. Bake in the oven for 10-15 minutes, or until mushrooms are cooked through. Add the chicken to a hot skillet or BBQ grill. Cook on each side for around 3 minutes or until cooked through. Slice your favourite burger filling ingredients and once the chicken and mushrooms are cooked, build your little tower and enjoy!